Rome has a huge selection of hotels. On the whole they’re reasonably priced considering you’re staying in a major European capital. You can take the Rome metro to the Colosseum, it has its own Colosseum station. However, it’s location in the center of Rome probably means you’ll be able to walk there. Because it’s the largest Roman Amphitheater in the world it’s likely you’ll see it long before you arrive. 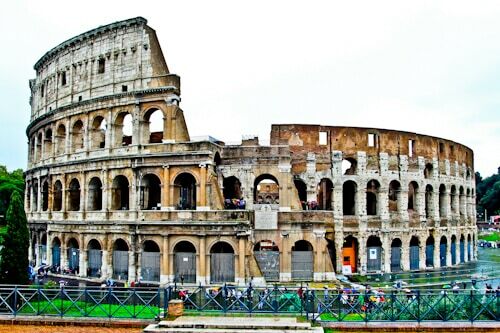 The reason the Colosseum is damaged is mainly due to the effects of severe earthquakes. 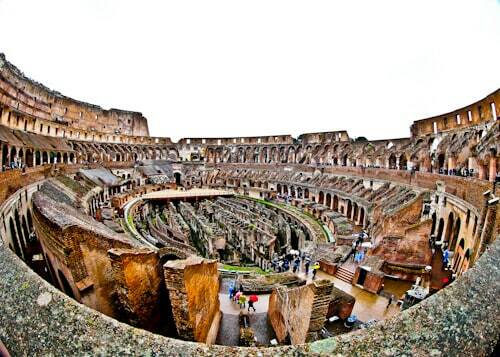 In Roman times the Colosseum held between 50,000 to 80,000 spectators. This makes it about the same size as the San Siro stadium in Milan. You are welcome to explore the spectator area, very few areas are cordoned off. Today only 30% center of the arena exists (rebuilt). The other part of the arena has collapsed into what was the underground of the Colosseum. As you walk around the interior, you should appreciate its design. There are over 80 exits which is more than some modern football stadiums. A famous movie scene featuring Bruce Lee and Chuck Norris was filmed in the interior. In this historic scene they were chasing each other through the walkways. It’s actually quite a good little tour of the Colosseum! James Bond drives on the main road in front of the Colosseum in the Spectre movie. Even if you’re not a James Bond fan, it gives you the feel of driving past the Colosseum. In addition part of the Samuel Jackson movie Jumper was filmed here. The Way of the Dragon starring Bruce Lee (above) is the most famous movie to feature the iconic building. There were 80 vertical shafts that connect the underground to the arena. Hence, an animal could suddenly appear on stage through a trap door. There are 32 animal pens, as well as several tunnels connecting them. You must book in advance to visit the underground. 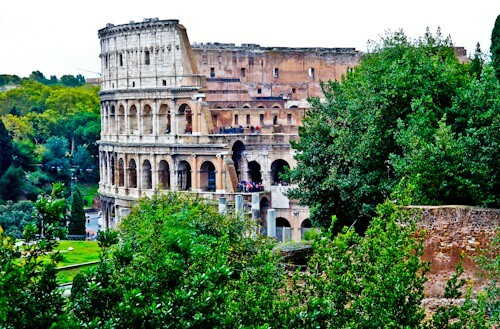 As the Colosseum is huge it’s best photographed from a distance. In fact, if you decide not to go inside, you’ll still go home with amazing photos. It’s located in between Ancient Rome, Colle Oppio Park and a main road. This means you can photograph it behind trees. Additionally you can photograph it with other ancient monuments of Ancient Rome. You may think it’s the ugly option to photograph it in front of the main road. However, with all the lights and the moving vehicles you can make an interesting shot (below). The Colosseum in the centre of Rome. 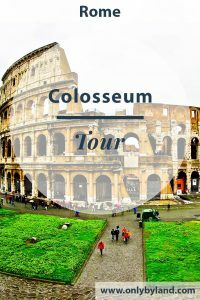 It’s likely you’ll visit the Colosseum during the day as that’s when it’s open. You must make an effort to visit it at night time though, when it’s lit up beautifully. Photographers will enjoy photographing it with the vehicle lights passing. This is a location where long exposure shots are very rewarding. Before visiting you must decide how much of the amphitheater you want to see. For some people it’s enough just to see the exterior. Some visitors want to walk around the interior. Finally, those with a great interest in Roman history will also want to visit the underground. 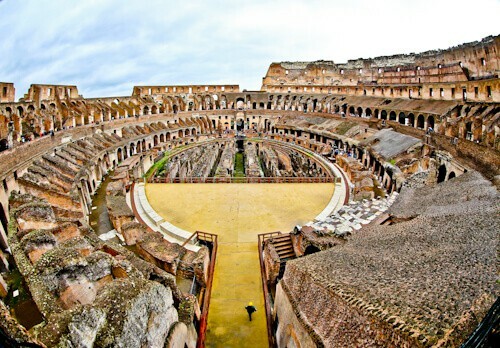 Check out the Roman Amphitheaters in Verona, Pula and Pompeii. I didn’t know about the underground at the Colosseum. I will definitely book my ticket in advance and visit! I like the idea of photographing it with other historic landmarks in the picture too – great idea! Hi Jake, enjoy your visit to the Colosseum – I hope you have better weather than I did!